BROWN (US) — Which animals survive as climate changes may depend on their the ability to adapt to rapid temperature shifts and less-than-optimal conditions as they expand their range. 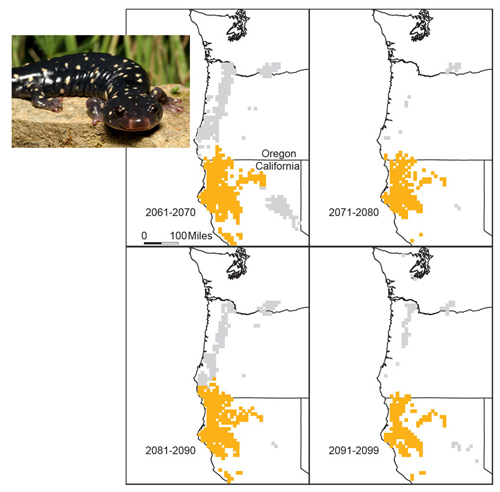 New research based on simulations examining species and their projected range examined the projected “climate paths” of 15 amphibians in the western United States to the year 2100. Using well-known climate forecasting models to extrapolate decades-long changes for specific locations, researchers determined that more than half of the species would become extinct or endangered because of swings in temperature that could trap species at different points in their travels. The severity or duration of those climate swings, coupled with the given creature’s persistence, determines their fate. “Our work shows that it’s not just how fast you disperse, but also your ability to tolerate unfavorable climate for decadal periods that will limit the ability of many species to shift their ranges,” says Dov Sax, assistant professor of biology at Brown University. The researchers chose to study frogs, salamanders, and toads because their living areas are known and their susceptibility to temperature changes has been well studied. Based on that information, they modeled the migratory paths for each creature, estimating their travels to be about 15 miles per decade. The temperature swings can cause a species to be stopped in its tracks, which means that it has to do double time when the climate becomes more favorable. The study also considers a species’ ability to weather adverse intervals. Early and Sax say unfavorable climate lasting a decade would put the species in a bind. If the interval lasted two decades or more, it was likely the species would become extinct. Rapid changes to climate already being witnessed underscore the study’s value. A growing number of scientists believe climate change is intensifying so quickly that the planet is hurtling toward a sixth mass extinction in history—and the first widespread perishing of creatures since the dinosaurs’ reign ended some 65 million years ago. For the first time, species are grappling not just with projected temperatures not seen for the last 2 million years but also with a human-shaped landscape that has compromised and fragmented animals’ natural habitats. Early and Sax say wildlife managers may need to consider relocating species, an approach that is being hotly debated in conservation circles. “This study suggests that there are a lot of species that won’t be able to take care of themselves,” Sax says.